There are quite a few festivals coming your way, celebrating everything from culture, the environment, gastronomy, cinema, music, the arts, community development and sports to just plain being alive. The Riviera Nayarit has been working with different groups to organize some magnificent events for February. There are a total of ten if you include the San Blas International Migratory Bird Festival, which starts in January but continues through February 5th. Along the same lines, the International Bahía de Banderas Regatta starts on the last day in February and continues until March 4th: http://www.banderasbayregatta.com/. Now in its fourth year, the Festival is ready to party with the tagline “Movies, Music, Drink and Life.” And there will be plenty of that for visitors: movies and short-length films projected on huge screens on the beach, food and drink, physical activities and a fantastic concert headlined by Café Tacvba and Nortec Collective. 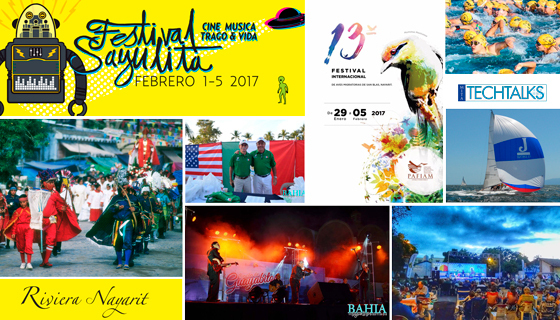 http://www.festivalsayulita.com/. This festival has been celebrated every Saturday of the month for the past 10 years, offering a varied mix of performing arts on the main plaza. http://www.hotelesdeguayabitos.com.mx/. San Pancho is art, family togetherness, love and happiness and it’s all expressed during this festival that’s also been going on for more than 10 years. The themed parade is an invitation for all to gather at the Plaza del Sol, where they can enjoy high-quality shows. http://es.entreamigos.org.mx/. Punta Mita welcomes experts in the latest technologies, gadgets, launchings, innovations and trends in order to address the demands of a new century and its invitation to modernize. http://mitatechtalks.com/en/home2/. Prepare for three days of great music with local, national and international artists at the Cultural Capital of the Riviera Nayarit. The Plaza del Sol will once again host these top-level shows. https://sanpanchomusicfest.wordpress.com/. New challenge, new location. This first edition of this open water tournament in the waves of San Blas is open to all the country’s swimmers for 1k, 3k, and 6k competitions. http://aguasabiertasmatanchen.com/.